Reviews for this have been pretty good so far. Currently at 100% on Rotten Tomatoes with 21 reviews. Well...that was fantastic, and I eagerly look forward to the remaining 7 episodes. I've always found Sandra Oh a bit off-putting, -and her years as her "Grey's Anatomy" character didn't help, -but I rather enjoyed her work here. The scene in the beginning where the one lady was describing how the victim was killed and Sandra's reaction was hilarious. This seems a little misadvertised to me. The tone is much lighter. Regardless, good first episode. BBC America agressively marketed this show. I got new DVR recordings of Broadchurch, Doctor Who, and Orphan Black, ostensibly for specials that were really promos for Killing Eve. The Doctor Who recording was 2 minutes of "The Women of Doctor Who" followed by 5 minute promo for Killing Eve. The Orphan Black special was actually 30 minutes long of 5 fan favorite scenes, with Killing Eve promos in all the commercial breaks, followed by the first episode of Killing Eve days before the "premiere." It almost turned me off the show, which is a shame because I liked the first episode. From the looks of this thread it seems not many were interested in this show which is a shame because I think it was fantastic. I was reminded about this series when the Golden Globe nominations were announced and binged the entire season today. While Sandra Oh was very good it's Jodie Comer who steals the show as the doe-eyed psychopath. Part psychological drama, part crime procedural with a fair amount of humor mixed in, this is highly recommended. Plus, since it's only (8) 42 minute episodes it's not that much of a time commitment. It's also all up on Hulu, for anybody that cares. I really liked the first season. Looking forward to season 2. This was surprisingly good. Feels like forever since it was on, though. Last edited by Boondock Saint; 12-11-18 at 02:35 AM. I thought it was a great show and I can't wait for season 2. It was definitely something different and off-beat. I wouldn't say I loved it, it felt a little contrived at times and I hate watching shows where the protagonist is an unsympathetic killer. 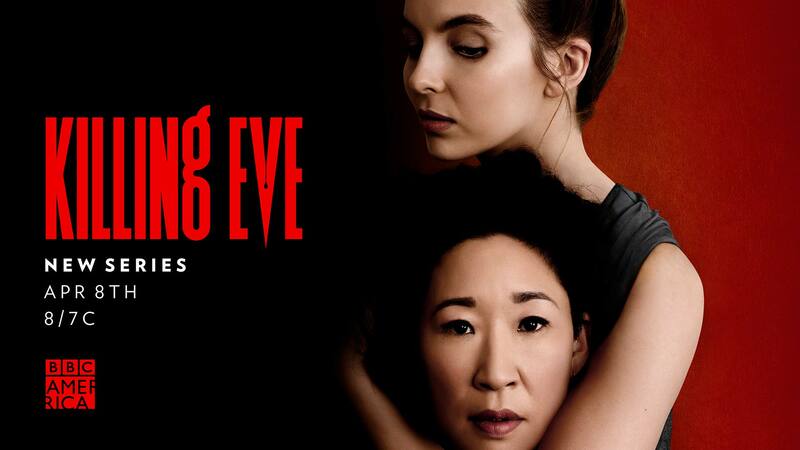 I've watched the first four episodes and I'm shocked all the accolades are going to Sandra Oh and not Jodie Comer. Sandra Oh has a few more nominations overall, but that could possibly be political, considering she's the "star", or bigger name, and the show may not want to submit both actresses for the same category, thinking it might split the vote and let some other show win. Because people really care about the Golden Derby awards... Ok, if you want to get specific about it... I've watched the first four episodes and I'm shocked that Emmy and Golden Globe nominations are going to Sandra Oh and not Jodie Comer. There's no comparison. I don't care for the award politics of it. It does feel like Sandra Oh playing Sandra Oh once again in the role. She's the "bigger" name and producers likely picked her to push in award season, even if the other female lead is doing a much better job. Well, there's also the Television Critics Association Awards and the Critics' Choice Television Awards. Ok, if you want to get specific about it... I've watched the first four episodes and I'm shocked that Emmy and Golden Globe nominations are going to Sandra Oh and not Jodie Comer. Then you don't care for awards. I learned a long time ago that awards aren't a true determination of quality, there's always going to be politics and bias. Thanks for trying to correct my opinion... I guess. In general with tv award nominations the bigger name actor/actress will usually get the nod.Comer definitely deserved more awards,but she is a UK based actress and her series also isn't on a high visibility network(HBO,SHO,Netflix,FX etc.) who can push people to nominations. Even the monster smash Game Of Thrones watched by considerably more amounts of people,the only Emmy acting nomination in season 1 was for veteran Us based actor Peter Dinkledge. ^ True. It took a long time for Tatiana Maslany to get recognized come award season (and for a show on the same network. Hmmmm. ), and while she finally did, her better work was in earlier seasons of Orphan. Binged this earlier in the year. Love both women in it and I can't wait for the 2nd season. I don't know that her work was all that much better in the first season. I just think the material was better. For instance, they never really knew what to do with Helena after season one. It was like a character who was supposed to go away in the first season, but they liked her too much to get rid of her. As for Killing Eve, I would echo the sentiments that Comer was the one that really popped in this show. Thought she was really good in White Princess as well. I didn't think KE was quite as good as the buzz it received though.